The FIS Alpine Ski World Cup took place in Schladming/Austria in 2013. Therefore the infrastructure was prepared for the crowds of spectators. The “old” valley station building needed to make way for a new structure. 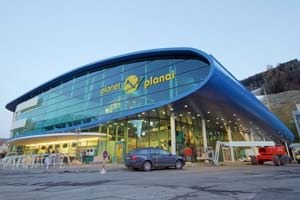 The entire imposing building the “Planet Planai” is covered by a loop. The glass façade on the front with an area of approx. 1,000m² is held by anthracite grey aluminium girders which have been powder-coated by ZINKPOWER Coating GmbH in Wiener Neustadt/Austria.